A simple recipe does not make it uninteresting, on the contrary! 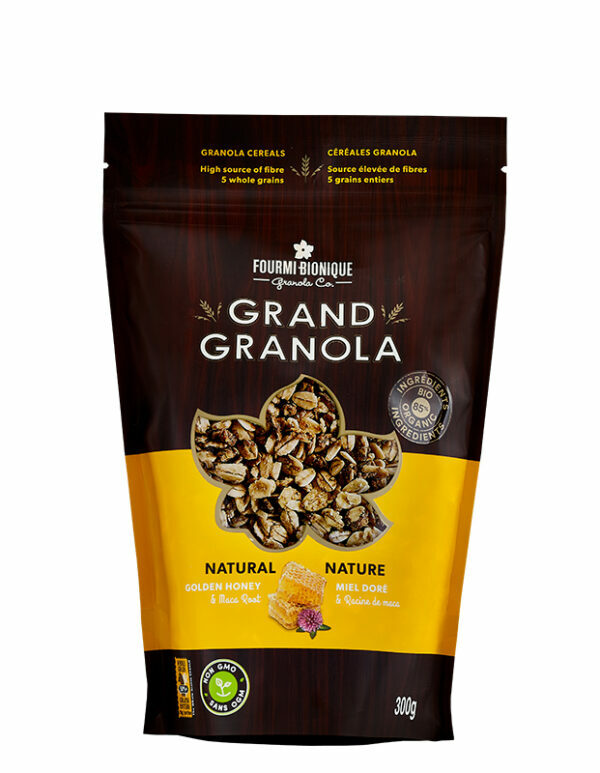 Grand Granola Natural is a crunchy granola blend made with local organic cereals that are perfectly golden with Quebec honey. You will find all the nutritional promise and authenticity of a wholesome granola, brought to the essential and enhanced by a touch of tamari sauce and a pinch of maca root. The Natural Grand Granola is the ideal base for breakfast, desserts or to add as garnish, depending on your mood and imagination. Find inspiration with our simple and creative recipes! The Grand Granola Natural is available in an economic and recyclable bulk packaging. It is also offered in the NUTBROWN grain-free and gluten free granola range. Rolled oats*°, Sugars (honey°, cane sugar*), Whole spelt flour*°, Sunflower oil and/or Canola oil, Rolled rye*°, Rolled barley*°, Oat bran*°, Tamari* (water, soybeans*, wheat*, salt), Coconut*, Flax seeds*, Sesame seeds*, Maca root powder*. The sweet of deep golden honey meets the tangy team of tamari and coconut crunch. Simply inspiring like a path that breaks to a view of endless horizon.